Like so many others, I found myself a little freaked out by the final installment of “Monday Night Football.” The way ABC presented that Jets-Patriots game, you would have thought “Seinfeld” was wrapping up or something. When the game finally finished, Al Michaels appeared ready to start bawling on live TV. He really did. I kept waiting for them to break out that Green Day song as a final touch. 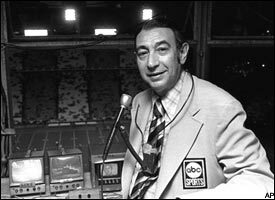 Which begs a simple question: Has the phrase “Monday Night Football” meant anything beyond “Cool, there’s a game on tonight!” since Howard Cosell left in 1983? Despite one of the most successful runs in the history of prime time (36 years), you could make a pretty good case that ABC actually underachieved with the show. Just add up the number of announcers, sideline reporters and halftime hosts from 1983 to 2001 alone — this wasn’t exactly the ’98 Bulls breaking up here. Besides, isn’t the Monday night franchise simply moving down the dial to ESPN? Maybe the Worldwide Leader is available in 20 million fewer homes than ABC, but do you know anyone in any of those 20 million homes? More importantly, will your football routine change on Monday nights next year? I didn’t think so. That didn’t stop the broadcast of Monday’s Jets-Pats game from attempting to become the sports equivalent of Johnny Carson’s final show, or the national media from pounding that “Farewell To An Icon!” angle into the ground over these past few weeks. Apparently we were supposed to care more than we did. Believe me, I’m in the exact target audience of people who should have been affected by Monday night’s game. I grew up in the late ’70s preaching to the altar of Cosell’s halftime highlights, one of the five coolest things on television at that point. When Earl Campbell ripped off four touchdowns against Miami, I remember where I watched the game. When Cosell announced John Lennon’s death, not only did it happen during a Pats game, but our kicker was lining up to kick a field goal. So when they showed those old clips Monday, they meant something to me. But I didn’t care about any of the post-Cosell clips, with the possible exception of the dude who jumped into the runway to catch that field goal. And that was the biggest problem here — comparing the Cosell Era to the post-Cosell Era was like comparing the Beatles to Wings, or even the Smashing Pumpkins to Zwan. It’s not even remotely worth it. Two things made the Cosell Era stand out. First, you couldn’t replicate the Gifford-Meredith-Cosell team if you tried (as ABC slowly found out). Gifford was the most popular football player of the ’50s and ’60s, a matinee idol in every sense, as well as one of the few athletes who successfully crossed over into broadcasting. Meredith was a force of nature, just a likable guy who appealed to everyone in every part of the country. And Cosell pretty much hijacked that show and made it his own personal pulpit — he was the one who transformed that telecast from “mere football game” to “polarizing television event.” Whether you hated Cosell or loved him, you had an opinion about him. He mattered. More importantly, we had like only six channels back then. Maybe “Monday Night Football” was a huge deal, but so was “Fantasy Island,” “The Incredible Hulk” and everything else. Yeah, the Meredith-Gifford-Cosell team meant something to me, but so did Bill Bixby and Cheryl Ladd. So did Jimmie Walker. So did Donny Most and Mindy Cohn, for God’s sake. Growing up in the late ’70s, there really wasn’t much to do. I’m telling you. And that’s what confused me about Monday night’s telecast — they were saying good-bye to an era that everyone had already dismissed and digested. Sure, I miss Cosell and Dandy Don, but I also miss seeing Charlene Tilton in her soaked bathing suit after falling into the dunk tank on “Battle of the Network Stars.” What’s the point? The fact remains, “Monday Night” started losing its cultural relevancy in the early ’80s, as soon as everyone started getting cable and Cosell called Alvin Garrett “that little monkey” during a Redskins game in 1983. Once everyone realized that the man was slowly losing his mind, that was it for him and the show. It became a simple prime-time sporting event after that. The bigger issue here (and one everyone fails to mention) was how many mistakes were made since Cosell’s departure. With the exception of Dennis Miller’s hiring, ABC made a concerted effort in the post-Cosell Era to emphasize football and steer away from the entertainment angle. They just hired the wrong guys and gave them the wrong directions, so there was a perception that they were tinkering just to get headlines. Even stranger, sports TV writers mistakenly believed that we cared about this stuff — what was happening at halftime, who was joining the booth, the new faces on the sidelines — when we were watching only because we needed a football fix, because we liked one of the teams, because we wagered on the game, because (in later years) we had fantasy guys involved. With the exception of Miller’s first few games, nobody was watching for the announcers. And yet, ABC and all these sports TV writers made us think we cared. Did you see that Boomer Esiason is joining Monday Night Football?!?!? Wow! That’s big news! although there was a sense of desperation to the move, like they wanted to reinvent the franchise and didn’t know exactly how to pull it off. Everyone forgets this now, but back in the summer of 2000, Sports Illustrated slapped Miller’s mug on the cover with the headline “Can Dennis Miller Save Monday Night Football?” Clearly, the “Monday Night” franchise was struggling more than anyone wanted to believe. During the last few years, the ship was righted (somewhat) with the Michaels-Madden-Tafoya team, although Michaels and Madden had been working separately for too long and were too settled in their respective shticks to click on a substantial level — they always reminded me of one of those powerhouse duets from the ’80s (when celebrity duets were all the rage), like when Frank Sinatra teamed with Bono on “I’ve Got You Under My Skin.” During the final minutes on Monday night, it seemed like Madden wanted to feel emotional, only he wasn’t invested like during his final Fox game with Summerall (when both guys choked up). Michaels seemed considerably more distraught, but for what reason? Everything shifts over to ESPN next season. He still has a job. He had more partners over the years than a barista at Starbucks; he couldn’t possibly have felt verklempt about any of them. So why get bent out of shape? Again, not a huge problem here — it’s coming back next year on ESPN. Seemingly everyone has the Worldwide Leader. In fact, I know only one person who doesn’t have cable: My stepmother’s sister Becky. That’s out of all the people I know. We’re talking hundreds and hundreds of people. And you know what those people will do next September? Instead of watching “Monday Night Football” on ABC, they will pick up their remote control and flick over to ESPN. The whole thought process will take about 0.0003 seconds. I just remember watching those games in the late ’70s, waiting for the first half to end and hoping that he would spend even 20 seconds on a Pats game. This is one of those “You had to be there” things — kinda like how you had to be there to understand the sheer magnitude of a detective show that featured Jaclyn Smith and Cheryl Ladd. But you had to be there for Cosell. You just did. Now this is what we should have been celebrating. 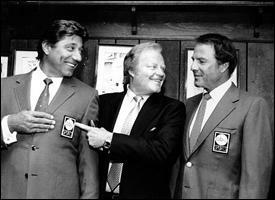 The Gifford-Cosell-Meredith team lasted through 1983 (augmented during the last few years by Fran Tarkenton, then O.J. Simpson), followed by an almost unprecedented two-decade run of decision making that rivaled anything Isiah Thomas ever inflicted on Knicks fans. Keep in mind, this was the premier announcing gig in any sport. ” and then Michaels would wait for a long enough pause so he could jump in and announce the next play. 1987-1997: Michaels, Gifford and Dan Dierdorf. Jeez, were these guys really together for 11 years? Apparently so. I always felt bad for Dierdorf, a quality color guy who was destined for what he’s doing now (straightforward nuts-and-bolts guy on CBS) instead of his ABC role (nuts-and-bolts guy with a personality). Well, Dan Dierdorf isn’t an entertainer, and he’s not a comedian. He’s a nice guy. And since Gifford was already filling that role, Dierdorf had to resort to a steady stream of “Ho ho hos!” and “I’m not so sure he isn’t the strongest human being on the planet!” and “You think these guys don’t care about this game!” and all that faux humor/sweeping hyperbole that drives us crazy. I thought it was interesting that he went to CBS and immediately became a normal person again. 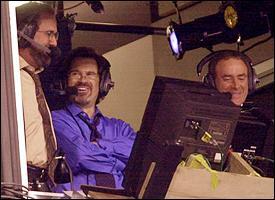 2000-01: Michaels, Dan Fouts and Dennis Miller. My favorite post-Cosell team. I loved when Miller called Michaels “Albeeno.” I loved those 4-5 Miller jokes per show that cracked Fouts up. I loved when Miller pretended he knew football with “serious” observations like “These guys can run the ball — they’ve averaged almost 4.2 yards per carry this season!” I loved when Michaels would crack jokes during blowouts because Miller was there — you could almost imagine Michaels sitting in his hotel room writing potential jokes just so he would be properly armed. but at least they were interesting. Actually, I enjoyed them. There. I said it. 2002-05: Michaels and Madden. Finally, some normalcy in the booth. During close games, these guys were good. During blowouts, not as good. But they certainly weren’t a train wreck. And when you consider what transpired the previous 20 years, that’s as good a compliment as anything. Still, isn’t it possible that an entire generation remembers this show for both the glorious Cosell Era and all the missteps and goofy moments that happened afterward? Why did the media ignore those misfires over these past few weeks? Why the kid gloves treatment? And while we’re asking questions, why was Michaels so emotional on Monday night? Maybe he just loves ABC that much. Maybe he realized that he spent nearly 20 years trying to turn the telecast into Destination TV. Or maybe it was because he never had a real chance in the first place. Back in the ’70s and early ’80s, “Monday Night” meant more than it probably should have. Of course, so did Dee from “What’s Happening! !” But nobody was living up to that Cosell-Meredith-Gifford team, and nobody was matching the importance that “Monday Night Football” held during an era where nobody had cable, DirecTV, iPods, video games or the Internet. That was truly the perfect storm of football broadcasting, something we will never see again. At least until Cosell is cloned. One final note: Near the end of that Jets-Pats game, Michaels made a big deal about the final score (31-21) being the same score of the first-ever “Monday Night Football” game in 1970. And sure, that was fitting. But you know what else was fitting? The game ended with 42-year-old Vinny Testaverde throwing the last touchdown in “Monday Night Football” history, followed by a failed onside kick and 44-year-old Doug Flutie kneeling to cement New England’s victory. And just like that, “Monday Night Football” was done on ABC. You could almost choke on the symbolism.